We didn’t confine ourselves to just the long established and well known bodegas. There were some smaller wineries we wanted to visit. And one of these was a ‘new’ guy with an established reputation. I was very much looking forward to this visit. This man is a legend in Rioja. He made some of the finest traditional Rioja wines in the 32 years he spent as head winemaker at CVNE. His Viña Real Gran Reserva 1976 was the wine that converted me to the wonders of old Rioja. He has now left CVNE but not because he wanted to retire if the enthusiasm for his new project is anything to go by. There were obviously other reasons for the parting of the ways. On the road from Haro to Laguardia you can see the impressive Calatrava designed YSIOS winery on your left, almost directly opposite is a more modest warehouse. You wouldn’t normally give it a second glance. Originally housing a co-op it’s where Basilio houses his ‘garagiste’ winery! He works with Viura, Malvasia and Garnacha Blanca. Apparently there are only 14 hectares of Garnacha Blanca in all of Rioja! We also discovered that originally Rioja was predominantly white. But the French who came south after phylloxera decimated their vines wanted red so as that was where the money was Spanish growers switched to red. Basilio production of white is about 2,000 bottles. He uses oak barrels and the equivalent of one barrel is fermented in glass demijohns. We tasted extensively from cask. It was difficult to evaluate the pear juice like liguid in our glasses in a very cold cellar. It was still fermenting and some samples had a lot of sulphur. But Basilio's hospitality was overwhelming. He had promised to speak slowly in Spanish I was doing well translating but the more enthusiastic he became the faster he spoke. from bottle. It's 75% Garnacha the remainder Viura and Malvasia. Pale colour- hint of green. Floral nose, touch of honey. Very crisp and clean. There is some fat to the Garnacha that I liked. Good structure. Apparently it is better with some years in bottle. The red wine B de Basilio 2007 is comprised of 66% Tempranillo 30% Garnacha 4% Graciano. This was quite cold in the winery and hard to evaluate so he gave us the remainder to try over dinner. I didn't take a formal note over dinner, sorry! However I recall being srtuck by how different it tasted to me. One of the more savory reds from Spain I had ever tasted. It was very understated and not at all overdone. Very easy drinking. Ideal at 6- 10 years we were told. A wine for longer aging is in the pipeline. on the other hand preserves individuality and character. As I understand it with clonal selection you get a plant with identical dna as it is taken from a single source. With Masal selection (essentially a survival of the fittest) the best vines are propogated so while the same family they are not identical. Therefore more diversity. I knew nothing about this bodegas wines but a winemaker in Ribera suggested I should visit. It was evening time when we drove up to the winery. Abel’s wife Maite greeted us. Abel has 37 plots in three different villages around San Vicente de la Sonsierra. While Basilio Izquierdo espoused the blend Abel Mendoza bottles tiny quantities of four varietals. TORRONTES VIURA MALVASIA and GARNACHA BLANCA. He has been battling with the regulatory authorities over a number of issues including his Garnacha Blanca. Apparently it's the wrong sort of Garnacha. He treats this claim with disdain telling them that at over a century old his vines pre-date the regulators! He can't just leave the D.O he says because unless he can market his wines as RIOJA he fears it will be an uphill struggle selling them at all. Even without fluent Spanish it didn’t take us long to realize this was a man with no shortage of passion. His young wine undergoes carbonic maceration in a traditional manner- Abel and some friends stomping on the grapes wearing wellies in a big concrete vat! 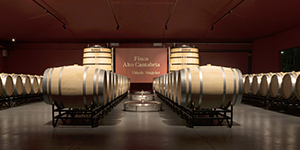 The crianza is aged in a mixture of new and used barrels and the three wines we tasted are aged in new oak. We were welcome to taste more extensively but it was late and we didn’t want to impose. Nice floral noes. Honeyed. Very rich on the palate.The Garnacha quite evident.Generous, viscous, not unlike a southern Rhone. Deep purple colour. Black fruits. Touch of lift/alcohol. Lively mouthfeel not heave but certainly big. Needs time. When he told us the berry by berry selection method I assumed he was aiming for extraction but this isn't a guy who chases points. You get the sense he makes his wine the way HE wants and corrected me quickly when I suggested his method was for maximum extraction. However this is a big wine at the moment and was the most upfront style I encountered in the entire trip. I bought a bottle so I can try again in a decade. Less expressive on the nose than the Grano a Grano. Deep ruby core.Seemed a touch unexpressive and ungiving from my (Tempranillo!) glass. A sniff from a different glass was altogether more forthcoming. Again this needs time to unfurl. Though given the passion and pride of the winemaker I'm happy to hang on. I have a bottle of this in the cellar now as well. We arrived late but we had to restrain Abel from opening more bottles for us. As the evening was wearing on language was no longer a barrier. He seemed to sense in us a similar passion for wine and this became our rosetta stone. Upstairs as Maite was wrapping our bottles the phone kept ringing. Eventually she felt the need to explain that it was her family and friends trying to get through as it was her birthday. And there she was putting bubble wrap around a few bottles of wine for complete strangers. This winery wasn’t on our itinerary initially but JesúsMadrazo said it was worth visiting. That was good enough for me. As we entered tho lovely village of Cuzcurrita we could see the castle. The adjacent buildings had been tastefully renovated and sensing a lot of money had been spent on the property we feared the worst, namely that we- wine buyers- would end up paying for it with over priced and over extracted wines. As we entered the winery and saw the six original Andy Warhol prints that suspicion was growing. But stereotypes are there to be broken. Cerrado de Castillo. The other wine is the Senorio de Cuzcurrita. The grapes for this come from 12 different plots. Many of the vines were planted in 1971 but one plot is about 100 years old. 25 hectares in total of which 15 belong to them. Light cherry core getting redder to the rim. Floral and smokey. Nice fresh fruit. Fresh. Clean. Some oak but not overpowering. Sees 12 months in oak. The first 6 are in new oak. The remainder in 2yr old barrels. Vibrant and refreshing in the mouth.Very moreish.Very good. Deeper red colour. More oak evident than on the Senorio but it doesn't dominate and will probably integrate. Floral and hints of vanilla. Then some mint. It constantly changes as it opens up. Both wines keep changing. I prefer the normal cuvee. It's just so drinkable. The roles may change with time. The property is at the outer limit of the region. It's cooler and this may account for the refreshing nature of the wines.They harvest very late. This was a very pleasant surprise. Lovely balanced wines and the best thing, fairly priced. The Senorio retails at about €17 and the Cerrado at €32. Customers don't end up paying for the Warhols after all! Am I the only one with problems on pics on main article (I mean the pics that are not in the right side of the screen)? I only have pics on the right of screen. Jose, do you see something strange in the text???? Nop, the text is ok. Nonetheless among paragraphs appear the usual symbol when pics are not loaded properly :-? Hmm... maybe a question of deprecated IE. Sorry Jose, didn't want to over do the pics!